Joe Colborne and I are alike in a few ways. We’re both from Calgary. We both grew up playing local minor hockey. We both grew up cheering for the Flames. Decades later, we’re both involved in the hockey world in Calgary – I’m in the media, while Joe plays for the Calgary Flames. I think it’s safe to say two things: that’s where our similarities end, and that Joe definitely has the cooler job. Colborne honed his hockey skills in a few places – the AJHL’s Camrose Kodiaks, the University of Denver and in the Boston Bruins system after being their 2008 first round pick. 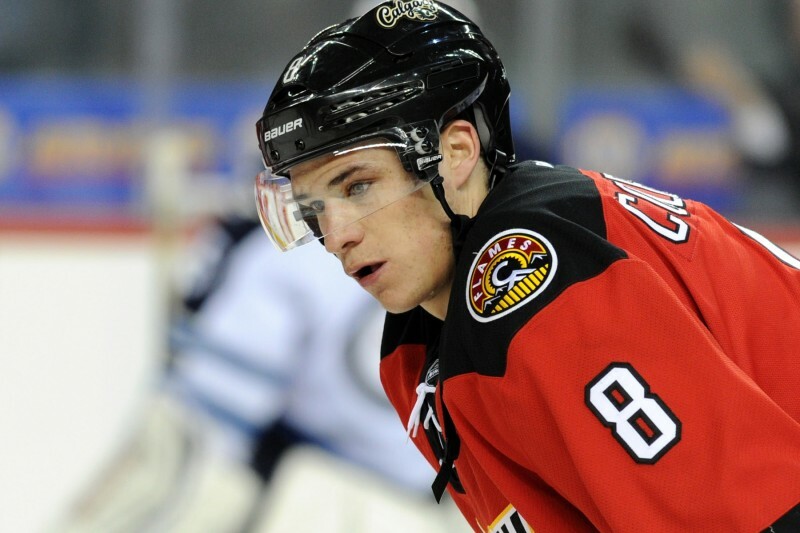 After a stop-over in Toronto, where he yo-yoed between the Maple Leafs and Marlies for parts of three seasons, Colborne was acquired by the Flames for a draft pick two days before the 2013-14 season began. For those who have never been to the Flames locker room, even after the June 2013 flood that destroyed much of the lower level of the building, the place is pretty breath-taking for anybody who grew up as a fan of the team. The hallway outside the locker room area features a wall listing the names of every Flames player who ever won a trophy with the club, with the columns of award-winners on either side of a large photograph of the 1989 Stanley Cup team. The hallway between this area and the main locker room features team photos from each and every Calgary Flames edition. More displays honouring award winners are also in this area. A message from Lanny MacDonald, Hall of Famer, greets you beside the first locker stall. And when you’re on the ice? Above the end the Flames use most frequently for practice – and the end they defend twice during home games – hang the team’s banners, including the retired numbers 9 (Lanny MacDonald) and 30 (Mike Vernon), along with Al MacInnis’ 2 (honoured in the team’s Forever A Flame program). Joe Nieuwendyk’s 25 joins them this weekend. Colborne admits that, for a kid that grew up idolizing many of the team’s best players from the 1980s and 1990s, pulling on the sweater still seems a bit surreal. The Saddledome may now be Colborne’s every-day place of business, but the 24-year-old noted that it’s still special to be following in the footsteps of guys he looked up to. Originally slated to spend time in the press box to open the season (he’d spent the entire pre-season with the Leafs and had to learn Calgary’s systems), Colborne was instead thrown into the fray when Matt Stajan went down with an injury in the first week. While Colborne (and the team) have struggled at times, they’ve also enjoyed some success. Currently in the midst of a points streak, he’s appreciative of the fans for supporting a rebuilding club – even during stretches where things looked bleak (like the team’s dreadful December). When Joe Nieuwendyk’s number goes up to the rafters, the Calgary Flames will be dressing 8 NHL rookies and a dozen players under the age of 25. None of these players were alive when the Flames won the Stanley Cup. While the names and numbers on the walls and in the rafters are a nostalgic reminder to the fans of fond memories, they serve as a sign to the young Flames of what may be possible – with a bit of luck, a fair amount of talent, and a heck of a lot of hard work. While their place in the standings may be an indicator of their current level of talent, the team’s unrelenting work ethic – even in the dog days of the regular season, with incredibly faint playoff hopes – may provide a foundation for a future that may live up to the legacy of the team’s past greats. Until then, each of the young Flames will do their level best to live up to the achievements of those that came before them, and perhaps do something worthy of getting their names painted on the wall outside the team’s locker room.